Roy Hodgson relished the satisfaction of victory against Liverpool as Chris Brunt's late penalty gave West Bromwich Albion a crucial triumph against the club that sacked him after a short Anfield reign. Hodgson was dismissed in January after only 191 days in charge at Liverpool - and while he insisted revenge was not on his agenda, there may just have been extra pleasure in the manner in which Albion earned three priceless points in their battle to stay in the Premier League. 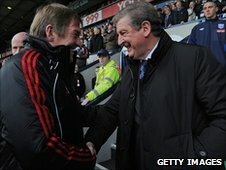 Liverpool boss Kenny Dalglish greeted his predecessor warmly before kick-off in front of a bank of photographers. Martin Skrtel gave the visitors the advantage with a header five minutes after the break. But Liverpool's defence, reshuffled after losing Glen Johnson and Daniel Agger to injury in the first half, was always vulnerable to the pace and direct approach of Albion striker Peter Odemwingie. And he was the pivotal figure as Albion earned two penalties, both converted by skipper Brunt to secure the win that extended Hodgson's unbeaten run as Hawthorns boss to five games and pushed the Baggies up to 12th in the table. Sotirios Kyrgiakos was penalised for pulling Odemwingie down after 62 minutes, although the defender appeared to make contact with the ball. Odemwingie was fouled again by Liverpool goalkeeper Pepe Reina two minutes from time to allow Brunt to repeat the punishment and send The Hawthorns wild. Liverpool's Luis Suarez - whose energetic and threatening display was in sharp contrast to his listless £35m strike partner Andy Carroll - almost forced an equaliser twice in the dying seconds but Albion held on for a hard-earned win. 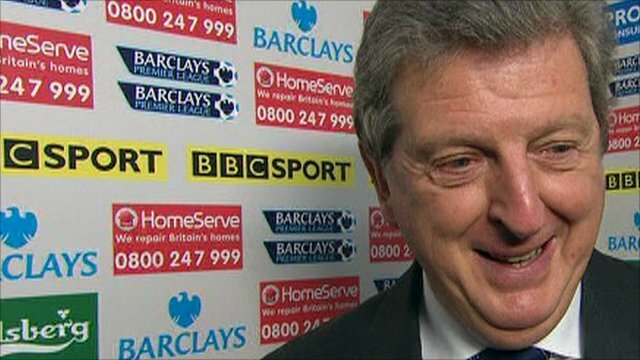 And while the scars on Hodgson's reputation as a result of his ill-starred stay at Anfield will take time to heal, he was afforded a great reception from Albion fans at the final whistle. Liverpool, in the continued absence of captain Steven Gerrard following a groin operation, were unchanged, with Carroll and Suarez paired up front. 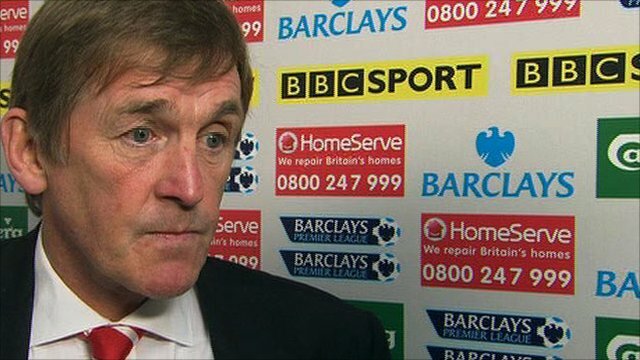 The continuity Dalglish hoped his selection would afford was soon disrupted when Johnson pulled up with a hamstring problem early on and was replaced by Kyrgiakos. Agger followed suit later in the half with what looked like a knee injury, forcing Dalglish to introduce Danny Wilson. Carroll endured a frustrating first 45 minutes in which he allowed himself to become distracted by the close attentions of Albion's defenders and the taunts of the home support. He was booked for a lunge at Steven Reid in the area before receiving two further lectures from referee Martin Atkinson. Albion posed what threats there were in a low-key opening 45 minutes as Liverpool keeper Reina saved Reid's low header and had to be alert to turn away a deflection off Skrtel as the ball flew towards his own goal. Skrtel's sense of direction was more accurate as he powered Liverpool into the lead five minutes after half-time, beating Paul Scharner in an aerial challenge to head in Raul Meireles' corner. Brunt had already tested Reina even before Skrtel's opener and Albion were not discouraged by the setback of falling behind, with the winger again testing the keeper with a powerful effort. Suarez was a constant threat with his direct running and he was furious with team-mate Dirk Kuyt for shooting straight at Albion keeper Scott Carson when he was free inside the area. Albion drew level just after the hour when referee Atkinson pointed to the spot when Kyrgiakos tangled with Odemwingie in the area. The Greek defender appeared to get a touch on the ball but Brunt accepted the decision gratefully to slam an emphatic penalty past Reina. The lift of that equaliser prompted Albion to carry the fight to a lacklustre Liverpool - and their ambition was rewarded with that dramatic late winner. Kyrgiakos never looked comfortable challenging with Odemwingie under a high ball and when he inevitably lost the battle, Reina tripped the Albion forward as he attempted to round the keeper. Brunt's penalty was as confidently dispatched as his first. As the game entered three minutes of stoppage time, and with Reina joining the fray for a corner, Suarez twice came close to earning Liverpool a point. Carson saved magnificently from his low shot and Nicky Shorey scrambled back towards the goal-line to head away his lob as it looked destined to drop in. Seconds later, Hodgson had the victory that will give him so much satisfaction as Albion took a stride towards Premier League safety. 90:00+3:49 The referee signals the end of the game. 90:00+3:22 Luis Suarez takes a shot. Nicky Shorey manages to make a clearance. 90:00+2:58 Luis Suarez takes a shot. Save by Scott Carson. 90:00+2:29 Corner taken by Raul Meireles played to the near post, clearance made by Gonzalo Jara. 90:00+2:18 Andrew Carroll takes a shot from 12 yards. Steven Reid gets a block in. 90:00+1:51 Gonzalo Jara challenges Luis Suarez unfairly and gives away a free kick. Jose Reina takes the direct free kick. 90:00+1:10 Substitution (West Brom) makes a substitution, with Gonzalo Jara coming on for Jerome Thomas. 90:00+0:15 Corner taken by Raul Meireles from the left by-line to the near post, Martin Skrtel has a headed effort at goal from deep inside the area missing to the right of the target. Correction - 90:00+0:02 Shot by Raul Meireles. Save by Scott Carson. 90:00+0:02 Shot by Raul Meireles. Save by Jose Reina. 88:40 Peter Odemwingie provided the assist for the goal. 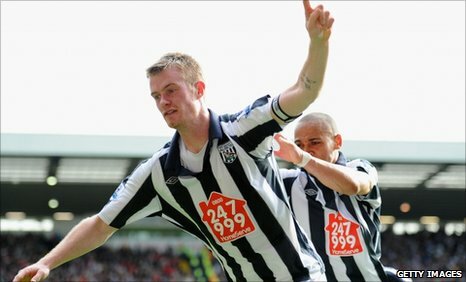 88:00 GOAL - Chris Brunt:West Brom 2 - 1 Liverpool Penalty taken left-footed by Chris Brunt and scored. West Brom 2-1 Liverpool. 87:12 Peter Odemwingie fouled by Jose Reina, the ref awards a Penalty. 87:12 Booking The referee shows Jose Reina a yellow card for unsporting behaviour. 85:57 Jerome Thomas concedes a free kick for a foul on Martin Skrtel. Jose Reina restarts play with the free kick. 85:57 Substitution Dirk Kuyt leaves the field to be replaced by Joe Cole. 85:57 Booking Jerome Thomas is cautioned. 83:41 Jerome Thomas has an effort at goal from 12 yards. Jose Reina makes a save. 81:43 The referee blows for offside. Scott Carson restarts play with the free kick. 81:24 Nicky Shorey delivers the ball. 81:11 The ball is crossed by Paul Scharner, clearance by Martin Skrtel. 79:27 Paul Scharner crosses the ball. 79:03 Shot by Peter Odemwingie. Blocked by Martin Skrtel. 76:00 Peter Odemwingie has an effort at goal from just inside the box that misses to the right of the target. 75:19 Drilled left-footed shot by Peter Odemwingie. Blocked by Jamie Carragher. 73:23 Free kick awarded for a foul by Dirk Kuyt on Youssouf Mulumbu. Scott Carson restarts play with the free kick. 73:23 Substitution Marc-Antoine Fortune is brought on as a substitute for Simon Cox. 70:47 The ball is crossed by Nicky Shorey, clearance made by Jamie Carragher. 68:55 Luis Suarez is flagged offside by the assistant referee. Scott Carson takes the indirect free kick. 68:07 Free kick awarded for a foul by Steven Reid on Luis Suarez. Raul Meireles crosses the ball from the free kick right-footed from left wing, clearance by Nicky Shorey. 66:36 Raul Meireles has an effort at goal from the edge of the area that misses to the right of the target. 65:33 Peter Odemwingie has an effort at goal. Save by Jose Reina. 64:26 Unfair challenge on Simon Cox by Sotirios Kyrgiakos results in a free kick. The free kick is swung in left-footed by Chris Brunt, Jose Reina makes a save. 63:47 The ball is swung over by Martin Skrtel. 63:23 Corner taken right-footed by Raul Meireles, clearance made by Paul Scharner. 63:17 The ball is crossed by Luis Suarez, blocked by Jonas Olsson. 62:25 The assist for the goal came from Peter Odemwingie. 61:40 GOAL - Chris Brunt:West Brom 1 - 1 Liverpool Penalty taken left-footed by Chris Brunt and scored. West Brom 1-1 Liverpool. 61:09 Penalty awarded for an unfair challenge on Peter Odemwingie by Sotirios Kyrgiakos. Correction - 60:32 The ball is crossed by Simon Cox. 60:32 Simon Cox delivers the ball. 58:28 Youssouf Mulumbu takes a shot. Paul Scharner gets a block in. 57:34 Effort from 18 yards by Chris Brunt. Jose Reina makes a save. 57:28 Nicky Shorey sends in a cross, Danny Wilson makes a clearance. 55:01 Dirk Kuyt takes a shot. Save by Scott Carson. 53:56 Free kick awarded for a foul by Luis Suarez on Jonas Olsson. Scott Carson takes the direct free kick. 50:44 Effort from just outside the box by Simon Cox goes over the bar. 49:43 Outswinging corner taken right-footed by Raul Meireles from the right by-line, assist on the goal came from Raul Meireles. 49:43 GOAL - Martin Skrtel:West Brom 0 - 1 Liverpool Martin Skrtel gets on the score sheet with a goal from inside the box to the top left corner of the goal. West Brom 0-1 Liverpool. 49:10 Effort from 20 yards by Andrew Carroll. Save by Scott Carson. 46:37 Danny Wilson crosses the ball, save by Scott Carson. Correction - 45:31 Shot by Simon Cox from 18 yards. Save made by Jose Reina. 45:31 Simon Cox takes a shot from 18 yards. Brilliant save by Jose Reina. 45:00+4:35 The players leave the pitch at half time. 45:00+0:58 Shot from 30 yards from Chris Brunt. Save by Jose Reina. 45:00+0:49 Peter Odemwingie crosses the ball, Sotirios Kyrgiakos makes a clearance. 45:00+0:25 The ball is swung over by Danny Wilson. 45:00+0:11 Shot by Chris Brunt. Save by Jose Reina. 43:56 The referee blows for offside against Youssouf Mulumbu. Jose Reina takes the indirect free kick. 43:14 Shot from 30 yards from Chris Brunt. Jay Spearing gets a block in. 42:24 Peter Odemwingie fouled by Danny Wilson, the ref awards a free kick. Direct free kick taken by Simon Cox. 42:24 Booking The referee cautions Danny Wilson for unsporting behaviour. 41:40 Centre by Jerome Thomas, Danny Wilson makes a clearance. 39:36 Peter Odemwingie takes a shot from just inside the penalty box which clears the bar. 38:17 The ball is swung over by Steven Reid. 36:10 Chris Brunt produces a cross. 35:43 Luis Suarez is ruled offside. Abdoulaye Meite takes the indirect free kick. 35:23 Jerome Thomas delivers the ball, Jose Reina makes a save. 34:28 Jonas Olsson fouled by Andrew Carroll, the ref awards a free kick. Jonas Olsson takes the free kick. 34:08 Peter Odemwingie has an effort at goal. Save made by Jose Reina. 33:08 Steven Reid takes a shot. Save by Jose Reina. 32:41 Leiva Lucas gives away a free kick for an unfair challenge on Paul Scharner. Chris Brunt takes the free kick. 32:17 Foul by Andrew Carroll on Paul Scharner, free kick awarded. Jonas Olsson takes the free kick. 31:32 Steven Reid crosses the ball, Paul Scharner gives away a free kick for an unfair challenge on Jamie Carragher. Jose Reina takes the direct free kick. 29:30 Free kick awarded for a foul by Andrew Carroll on Abdoulaye Meite. Direct free kick taken by Jonas Olsson. 29:21 The ball is crossed by Peter Odemwingie, clearance made by Raul Meireles. 27:32 Andrew Carroll gives away a free kick for an unfair challenge on Steven Reid. Scott Carson takes the free kick. 27:32 Booking The referee books Andrew Carroll for unsporting behaviour. 26:39 Paul Scharner concedes a free kick for a foul on Jay Spearing. Jose Reina takes the direct free kick. 26:39 Booking Paul Scharner is shown a yellow card. 24:45 Unfair challenge on Andrew Carroll by Jonas Olsson results in a free kick. Direct free kick taken by Raul Meireles. 23:56 Substitution Daniel Agger goes off and Danny Wilson comes on. Correction - 20:55 Free kick awarded for an unfair challenge on Peter Odemwingie by Leiva Lucas. Shot on goal comes in from Chris Brunt from the free kick, save made by Jose Reina. 20:55 Foul by Leiva Lucas on Peter Odemwingie, free kick awarded. Free kick taken by Chris Brunt. 20:25 Centre by Peter Odemwingie, clearance made by Martin Skrtel. 19:04 Dirk Kuyt has an effort at goal from just inside the box that misses to the right of the goal. 18:13 Unfair challenge on Andrew Carroll by Abdoulaye Meite results in a free kick. Leiva Lucas takes the direct free kick. 17:17 Jerome Thomas fouled by Dirk Kuyt, the ref awards a free kick. Jonas Olsson restarts play with the free kick. 15:38 Jay Spearing crosses the ball, save by Scott Carson. 14:20 Simon Cox takes a shot. Blocked by Martin Skrtel. 12:27 Steven Reid challenges Jose Reina unfairly and gives away a free kick. Jose Reina takes the free kick. 11:37 Foul by Daniel Agger on Peter Odemwingie, free kick awarded. Free kick crossed left-footed by Chris Brunt, save made by Jose Reina. 11:03 The ball is crossed by Luis Suarez, Jonas Olsson makes a clearance. 8:07 Andrew Carroll fouled by Paul Scharner, the ref awards a free kick. Free kick taken by Jose Reina. 7:39 Free kick awarded for an unfair challenge on Simon Cox by Dirk Kuyt. Chris Brunt takes the direct free kick. 7:04 Substitution Sotirios Kyrgiakos comes on in place of Glen Johnson. 5:11 Chris Brunt delivers the ball. 3:39 Raul Meireles crosses the ball. 1:56 Dirk Kuyt takes a shot. 1:15 Corner from the right by-line taken by Raul Meireles, Andrew Carroll takes a shot. Scott Carson makes a save. 0:44 Unfair challenge on Jay Spearing by Youssouf Mulumbu results in a free kick. Leiva Lucas takes the direct free kick. 0:18 Andrew Carroll produces a cross, Luis Suarez takes a shot. Save made by Scott Carson.